IVF stands for in vitro fertilization. It is a unique process of fertilization of egg cell using sperm outside the female womb. It is an in vitro process which gave birth to the first test tube baby Louise Brown in 1978. It is one of the most popular and majorly held treatments for infertility. On the other hand ICSI stands for Intra-cytoplasmic Sperm Injection. This is the latest and the most potential technique of insemination which is applied to achieve fertilization irrespective of the sperm quality when In vitro fertilization fails. Though a much latter developed process, ICSI has already managed a number of successful births and is fast merging as one of the highly opted artificial insemination processes that people are choosing upon. In case of in vitro fertilization there is no scope of any genetic disorder occurring in the zygote. But in case of ICSI, as even the sub-fertile sperm cells are used for insemination there is a chance that structural and numerical defects in the chromosomes may get carried. Hence prenatal screening is suggested. 1. IVF stands for in-vitro fertilization while ICSI stands for Intra-cytoplasmic Sperm Injection. 2. In vitro fertilization is suggested when other traditional modes of reproductive technology don’t work. Whereas, ICSI initiates insemination in case of inexplicable fertility problems and poorly surviving sperm cells. 3. In IVF the zygote has less chances of carrying genetic disorder, while in ICSI chances of chromosome disorder are greater. Abishek. "Difference Between IVF and ICSI." DifferenceBetween.net. 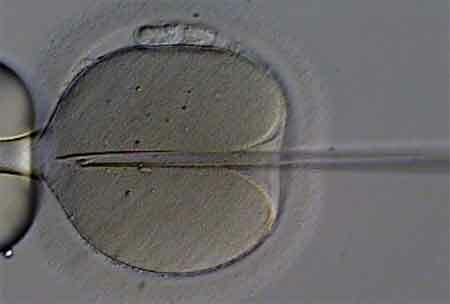 November 26, 2009 < http://www.differencebetween.net/science/health/difference-between-ivf-and-icsi/ >.